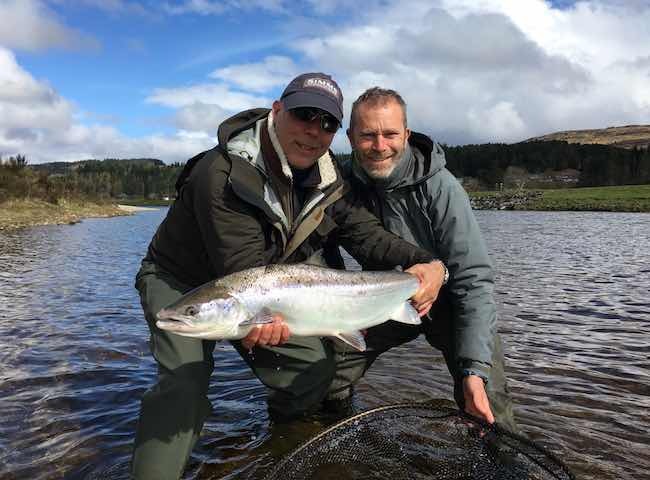 Here's a couple of happy salmon fishers with a perfect fly caught River Tay salmon. An encounter with a fish like this is always a highly memorable experience. 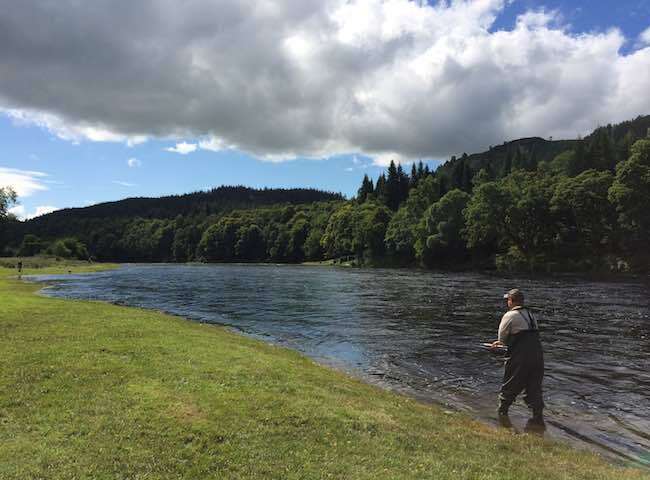 The River Tay provides a naturally beautiful environment to enjoy the most relaxing and informative introduction to the world of Scottish salmon fishing. 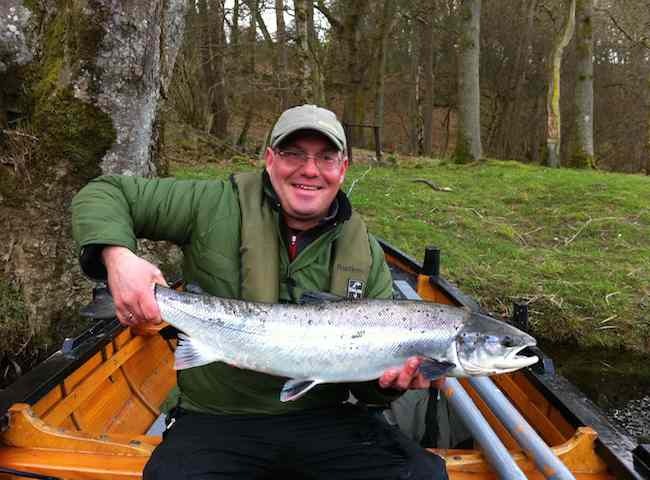 Here's one of my best colleagues and fellow professional salmon guide with a fine Spring salmon from the River Tay. All salmon fishing event days are overviewed by professional 'time served' salmon guides. Here's a perfect scene from the fabulous River Tay near Dunkeld. Book your colleagues a day of natural beauty on Scotland's most famous salmon river. Here's a beautiful shot of the fabulous River Tay near the town of Pitlochry. 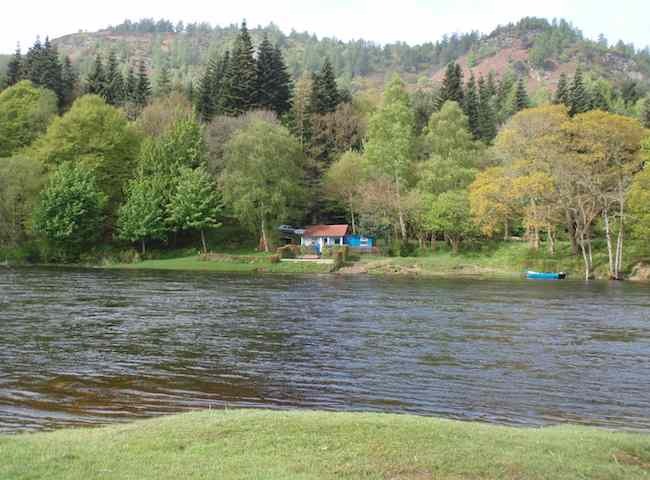 This area of the Tay Valley lends itself well to professionally organised salmon fishing events. Even under a moody sky there's fantastic natural beauty all around while out salmon fishing on the River Tay. Book a day of 'river therapy' on Scotland's most famous salmon river. It's always fantastic to come off the river at lunchtime after a morning's salmon fishing to a perfectly prepared and professionally catered lunch. Here's a selection of the required salmon fishing equipment at the ready. All the correct equipment including waders and waterproof jackets are provided on salmon fishing event days. Treat your business associates to a high quality introduction to Scottish salmon fishing via a River Tay fully guided salmon fishing event day. The Summer months have always been fantastic for being on the salmon river due to the sheer beauty of the riverbank environment and the settled water conditions. Scotland has some amazing salmon fishing rivers which are a delight to fish on. This lovely shot was taken on the famous River Dee which is a great salmon fishing event venue.